This takes place in the post apocalyptic world. What makes the game special is that the story takes place in the aftermath of a real apocalypse. The main characters have to find a way to survive in a world full of danger and uncertainty to assure the survival of the entire human race. It is a serious yet cool game about ordinary people who after facing extraordinary challenges decided to fight the threat of distinction instead of running away and hiding. You will have to find out how this disaster started, why the infection spread out and use that knowledge to win the war against zombies. Lives of other survivors will depend on your ability to overcome the challenges of the apocalyptic aftermath. You will watch how the catastrophe affected the world. Together, you WILL find a way to fight through to restore the order of life and assure preservation of the human race. The game is based on classic survival action play in closed areas, where you should use all you have got if you want to stay alive. There are a lot of tools, which can and will help you. For example, a handgun, mini-gun, grenade launcher and many others. Special abilities include, but are not limited to, time dilation, EMI and automatic placement of turrets, which could significantly help you complete your objectives. Playing with turrets is optional as you will be able to significantly increase skills of your character if you play without them. 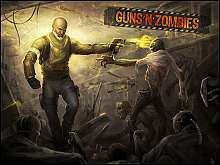 It has unique, detailed and fresh look to the nature of zombies as creatures infected by nanobots virus - mecha-zombies. Lots of enemies with unique behavior, abilities, and rage and randomly generated gameplay situations – every skirmish will be unique. It also has a cooperative game mode.